Now I tend to not be too loud about where I’m from, not that I’m particularly embarrassed by it, just not loud and proud of it either. I’m from a small market town on the outskirts of Stoke-On-Trent. But this is all about to change, as a matter of fact I’m heading home tonight to announce to James that we set sail at dawn, back to the Stoke area, immediately. This is all thanks to one wonderful man, Wayne Sadler. Who I hear you call at your computer screens, well not for long my friends, Wayne is a visionary on the level of Richard Branson (Not a great example but the only name that comes to mind at 1500 on a dreary hump day). His name will go down in history, for his creation of Barge-Inn-Booze. MIC – DROP. Yes my wonderful readers Wayne has set up the equivalent of a floating adults ice-cream van, serving beers, ciders and soft drinks, what a cracking idea. One of my earliest memories is accompanying my Nan and Granddad on their leisure boat for the weekend, stopping at a canal side pub in the evening, when pubs still smelt like pubs, and having a glass bottle of Coca-Cola in the play area with my little sister. With countless canal side pubs, or as I like to call them proper pubs, now closed, at threat of closure or taken over by gastro pub chains there’s little of this left. Whilst the concept is simple, and in my opinion blumin fantastic, I think anything which draws the public to the waterways to enjoy them and make use of them is wonderful (Or enjoy beer, mainly the beer), whilst feeding small (VISIONARY) businesses and planting fantastic memories, which who knows, could end up becoming a huge part of someones life some day. 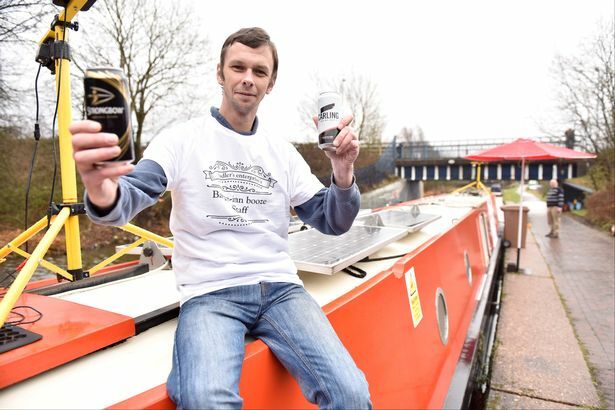 Everybody wish me luck in my persuasions, at the very least we may have to consider being the first Barge-Inn Booze Franchisee’s. For anyone in the area (I’m extremely jealous right now) and interested check out the article that first alerted me to this legend here or follow him and the Barge-Inn Booze on Facebook. Sounds like a great idea, good luck with the persuasion! !